In Ohio, Marathon Petroleum agreed to acquire Andeavor (formerly Tesoro) for $23.3 billion, based on MPC’s April 27, 2018, closing price of $81.43. ANDV shareholders will have the option to choose 1.87 shares of MPC stock, or $152.27 in cash subject to a proration mechanism that will result in 15 percent of ANDV’s fully diluted shares receiving cash consideration. This represents a premium of 24.4 percent to ANDV’s closing price on April 27, 2018. MPC and ANDV shareholders will own approximately 66 percent and 34 percent of the combined company, respectively. The deal creates the largest US oil refiner (and a top-five refiner globally) at 3.1 million barrels per day of capacity — Valero is around the same size, but that includes overseas operations. The proposed acquisition geographically diversifies the portfolio into attractive markets and increases access to advantaged feedstocks: Andeavor’s refineries in California, the Mid-Continent and the Pacific Northwest complement MPC’s existing Gulf Coast and Midwest refining footprint. MPC expects to fully realize ≥$1 billion in annual run-rate cost and operating synergies within the first three years, in addition to the expected synergies from ANDV’s Western Refining transaction. At closing, Greg Goff, ANDV chairman and chief executive officer, will join MPC as executive vice chairman. As executive vice chairman and an executive of MPC following closing, Goff will provide leadership and be integrally involved in the strategy for the combined company. Goff, along with three other Andeavor directors, will also join the board of directors of Marathon Petroleum. MPC is the nation’s second-largest refiner, with a crude oil refining capacity of approximately 1.9 million barrels per calendar day in its six-refinery system. Marathon brand gasoline is sold through approximately 5,600 independently owned retail outlets across 20 states and the District of Columbia. In addition, Speedway LLC, an MPC subsidiary, owns and operates the nation’s second-largest convenience store chain, with approximately 2,740 convenience stores in 21 states. MPC owns, leases or has ownership interests in approximately 10,800 miles of crude oil and light product pipelines. Through subsidiaries, MPC owns the general partner of MPLX LP, a midstream master limited partnership. Through MPLX, MPC has ownership interests in gathering and processing facilities with approximately 5.9 billion cubic feet per day of gathering capacity, 8.4 billion cubic feet per day of natural gas processing capacity and 610,000 barrels per day of fractionation capacity. MPC’s fully integrated system provides operational flexibility to move crude oil, NGLs, feedstocks and petroleum-related products efficiently through the company’s distribution network and midstream service businesses in the Midwest, Northeast, East Coast, Southeast and Gulf Coast regions. The Company formed a joint venture with The Anderson’s, Inc., The Anderson’s Marathon Ethanol LLC, to construct and operate one or more ethanol plants in the U.S. Construction of the first plant, in Greenville, Ohio, began in late 2006, and the plant began production in Feb. 2008. Marathon has also acquired a 35% interest in The Anderson’s Clymers Ethanol LLC with a facility in Clymer’s, Ind., that began production in May 2007. Andeavor is a premier, highly integrated marketing, logistics and refining company. Andeavor’s retail-marketing system includes more than 3,200 stores marketed under multiple well-known fuel brands, including ARCO, SUPERAMERICA, Shell, Exxon, Mobil, Tesoro, USA Gasoline and Giant. 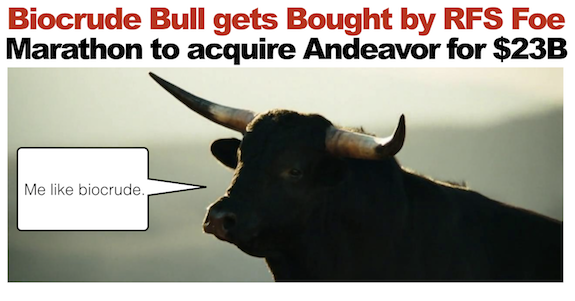 It also has ownership in Andeavor Logistics LP and its non-economic general partner. Andeavor operates 10 refineries with a combined capacity of approximately 1.2 million barrels per day in the mid-continent and western United States. Industry experts have not rated this a major issue for biofuels — but we of course look at relationships with Fulcrum, Virent and Ensyn that are potentially weakened — not strengthened — by this move.